SmartThings reminds you to please drink responsibly when controlling robots. In addition to securing your doors and locks, keeping an eye on loved ones, and triggering your home to automatically adjust to your unique preferences and patterns, SmartThings can also pour you a mean drink. 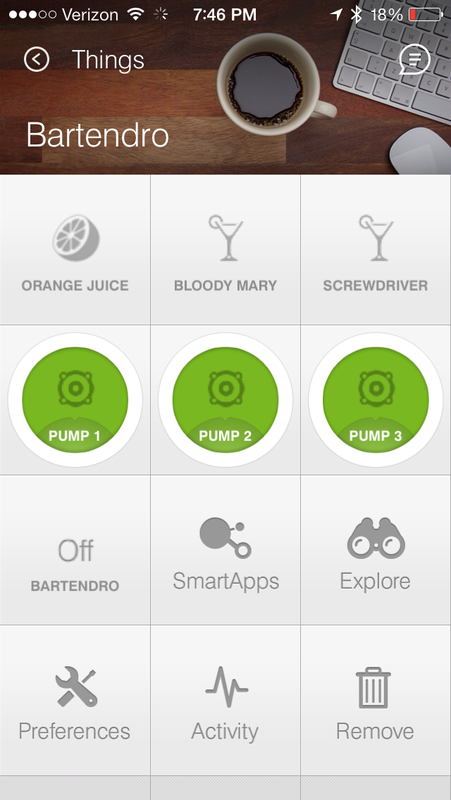 “Bartendro works on a Raspberry Pi which hosts a little Web app that triggers the pumps. The challenge here was to be able to send commands from the SmartThings cloud to the little computer. For this demo, I created a Python script that queries a DB hosted outside the Bartendro that triggers the pumps if a new entry is found. I also created a Device Type on SmartThings, that adds an entry, with the necessary params, based on the drink selection. Of course, this isn’t the first time that developers have used SmartThings to breathe life into an inanimate robot that can pour you a drink: Two summers ago, Andrew Urman created an ingenious shot-slinging bartender that would pour you a different-colored hit of liquor during the 2012 Summer Olympics each time Team USA was awarded a medal (Jack Daniels for bronze, Jose Cuervo for silver, and Goldschläger for gold). We can’t wait to see what developers from the SmartThings community think of next!